The horsemeat scandal will have a 'significantly negative' impact on trust in meat products, according to 50% of PR leaders. A further 41% believe it will have a ‘marginally negative’ impact, the poll of 136 agency chiefs by the PRCA reveals. Respondents were similarly united on their judgement of Iceland CEO Malcolm Walker’s decision to blame councils for the crisis, with 89% answering it was a ‘bad’ call. However, opinion was more divided over whether supermarkets as a whole or the Government and the Food Standards Agency have been handling the crisis the best. Half of respondents said supermarkets have and 44% said the Government/FSA have, with just 6% backing meat producers and suppliers. There was a split judgement about the Government’s response, which has been led by environment secretary Owen Paterson. Almost half (49%) pronounced themselves ‘very’ or ‘quite’ satisfied, while 41% were ‘very’ or ‘quite’ dissatisfied, and 11% were undecided. Two agency chiefs were particularly critical of Findus’ response to the crisis, chiming with previous views on the company. Storm Communications CEO Derek Lowe said: "Findus should have given a full and honest disclosure of the problem, expressed corporate shock that they had been let down so badly by their suppliers and their own quality control procedures, and a given a vigorous explanation of measures to ensure it will never happen again. Another shocking example of the head-in-the sand mentality of in-house crisis comms teams, with no game planning of how it could play out in the media." Rob Metcalfe, MD of Richmond Towers Communications, added: "They should hang their heads in shame at the damage they have allowed to their brand. They were too slow to accept the blame, be publicly contrite, and resolve to do everything it takes to restore the good name of Findus. That delay suggests they just don't care about their brand or their consumers." 1. Whose reputation has come out of the horsemeat crisis the worst? 2. Who has handled the on-going crisis the best? 3. What impact will this have on trust in meat products in the future? 4. How satisfied have you been with the Government’s response? 5. 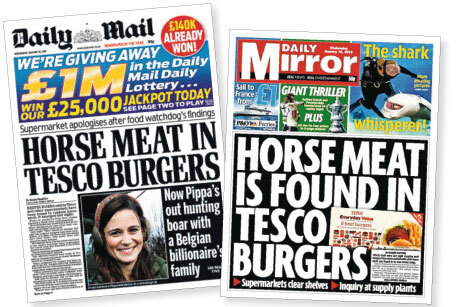 Was it a good decision for Iceland’s CEO Malcolm Walker to blame councils for the horsemeat crisis? 6. Do you expect this crisis to continue to escalate?